Reception: Sunday, October 14, 4 – 6 p.m. The idea for the “Invisible College” came from an emblematic illustration of the same title -- the 1618 work by Theophilus Schweighardt. Frances Yates in her book The Rosicrucian Enlightenment identifies this as the "Invisible College of the Rosy Cross." The Invisible College has been described as a precursor group to the Royal Society of London. This college mentioned in Rosicrucian Manifestos, is linked to alchemists like Robert Fludd, Michael Meier, Francis Bacon and John Dee, and a document of mysterious origins called The Chemical Wedding of Christian Rosencreutz. I liked the idea of a college that studied numinosum, invisible forces, alchemical imagination, and dreams. What if we could learn as much from inner visions as from texts? The inner world as a source of wisdom has always been an obsession of mine. I cast a bronze processional to carry a model of the college building on the wheels shown in the 1618 drawing. 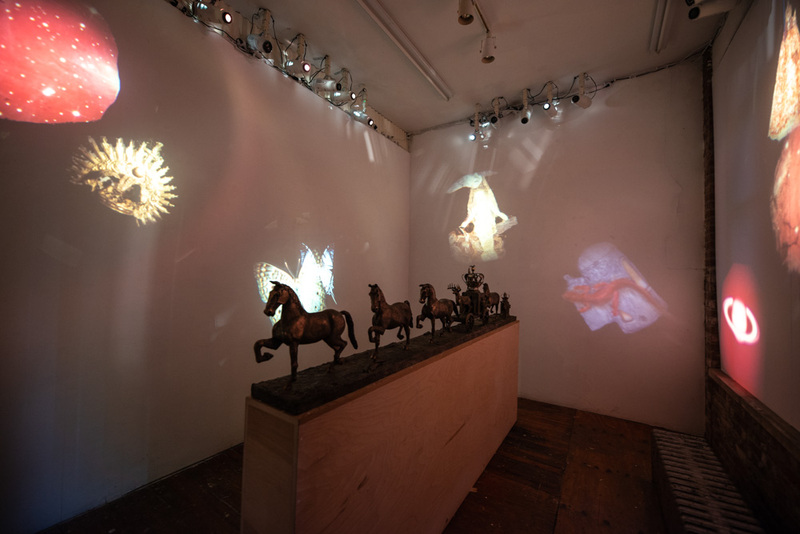 The GRIDSPACE installation contains my sculptural processional, and lantern slide projections. Some of the projected images are from nature, and some are from my large-scale drawings. Ann McCoy worked with Prof. C.A. Meier, Jung’s heir apparent for twenty-eight years in Zurich. She has a background in Jungian psychology, and anthropology, and has studied alchemy for over forty years. The images in my work come from dreams, a process known as incubation in the Greek world. Incubation, a “sleeping in” was used to record dreams for therapeutic and prophetic ends. For McCoy, dreams represent a phylogenetically older mode of thought and are linked to the transformation process described in alchemical symbolism, the Alchemical Great Work.